Larry Baker is an agent with the CIA. He is a 35-year old agent in very good standing with his bosses, especially his immediate supervisor, Raleigh, which is both surprising and not. On the 'not' side is the fact that when things are the darkest, he is always able to still find his way and he has pulled off some pretty impressive jobs when other agents have literally and figuratively died trying. On the 'yes' side is the the fact that he is an unrepetant womanizer, loves to lift a glass or three, reads girly magazines (this is the late 70s. remember) at work more often than he does reports, and is constantly fudging on his expense reports. Baker is most definitely a man of the world as he has been to many, many places and met lots of people in his line of work. Those who have not had to try to kill him as part of their assignment have had not difficulty admitting that they liked him for he is a most agreeable man. He is neither overly opinionated nor obsequious. He is honest in most everything he says, unless he is wooing a babe and then all bets are off, but he is not pushy and is quick with a shrug if you do not agree. Most important for his ability to get along and to get the job done, Baker is quietly smart. He observes. He collects information on his surroundings and he comes up with logical conclusions that are right far more often than not. One interest aspect to Baker's job is that he works out of a field office in New York City, not in Langley. The building to which he reports is in Manhattan and is readily available for walk-ins who might be curious what the Defense Department did in a facility named the New York State Recruiting Statistics Correlation Center. Such visitors are quickly and politely told a better location for whatever they were seeking and none got past the receptionist unless they belonged. Baker belonged, of course, for two reasons. The first is that the office truly was a CIA front and he truly worked for them and the second is that the DOD did allow the subterfuge but Baker was actually still an officer in the U.S. Army, holding a rank of Lt. Colonel. Baker would find that such a rank was perfect for him because it was high enough to be impressive but not so high as to be considered responsible for anything wrong. Larry Baker has a theory backed by computer analysis - statistics show leaders of the Free World contracting cancer at a far higher rate than normal. Once he mentions it, people start trying to kill him. Arab leaders are being targeted by terrorists and Sheik Mohamed is next on the list. Unfortunately, he has planted nuclear bombs beneath Jerusalem and Tel Aviv and if he goes, they go. Larry Baker has been tasked with keeping him alive. Someone high up in the British government is leaking information. 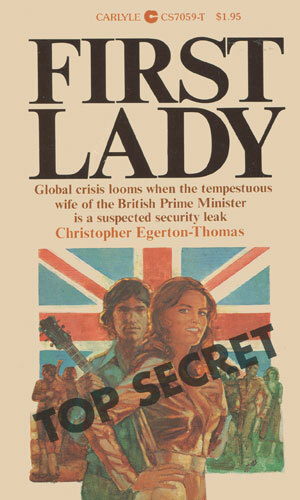 The young and feisty wife of the Prime Minister likes to hit the night spots in New York and may be the problem. Larry Baker is assigned to keep and eye on her. 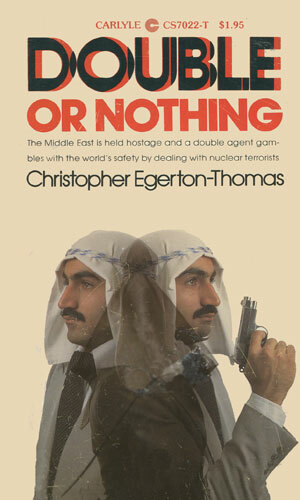 It is interesting to me at least that when researching for any spy series, the moment I found the first book in the series, the cover jumped out at me and a memory light went on. Obviously I had seen it before but I could not remember having read the book back when it came out. Of course, I read so very many back then and it really was 'back then' so may I did. 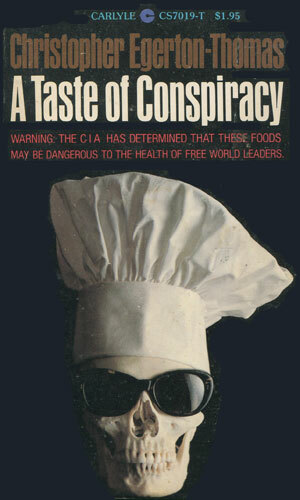 The cover was unique, though - a skull with sunglasses and a chef's hat. This three-book series is definitely worth your time if you like good solid spycraft with a small dollop of sardonic observations. Baker is not so much a cynic as a realist and he tries hard to not deceive himself. The bad guys are reasonable and believable and the fellow players all have their interesting quirks. I thoroughly enjoyed each of the three books about Baker and if there had been more, I would have read more.